Mr Roger Goh, 29, is living his dream. Since he picked up aquascaping in 2004, he has wanted to open an aquascaping shop. Now, he is the proud owner of Fishy Business, an aquascaping retail gallery and one-stop shop at 46, Sims Place. Instead of carrying on the family manufacturing business after completing national service, Mr Goh left after three years to fulfil his dream. "I thought I would give it (working in the family business) a few years, but I decided it really wasn't for me," said Mr Goh. He opened his first aquascaping shop, an online business, in early 2012. After a year selling equipment online, Mr Goh opened his first shop in the Ubi area. His shop at Sims Place is his second and it opened about four months ago. Said Mr Goh: "I wanted to meet my customers and share tips on aquascaping with them." Friendly and ever eager to help, Mr Goh hopes to spread his knowledge and passion for aquascaping to other Singaporeans. 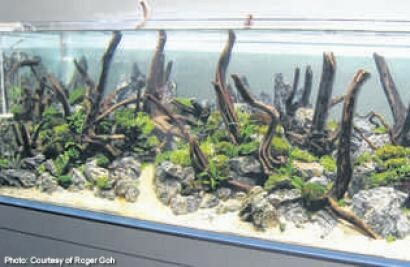 Said Mr Goh: "When I first started, there wasn't any available help... no aquascaping workshops, nothing." Most of his initial knowledge on aquascaping was obtained online. The Internet may have been a great source of information, but materials like rocks and wood were scarce then, he said. "I used to travel all the way to places like Pasir Ris and Jalan Kayu once a week to source for materials." The inaccessibility of these places and the lack of information for local aquascapers propelled Mr Goh to open his shop. Inspired by Japanese-style aquarium shops, Fishy Business is a walk-in retail gallery with display tanks to show customers what aquascaping is all about. True to Mr Goh's concept of being a one-stop shop, there is a variety of rocks, wood and plants for aquascapers to choose from. Guidebooks on the basics of aquascaping are also laid out on a shelf near the entrance and Mr Goh is always willing to share his experience. "I have customers calling me at midnight to ask for help and I'm always there to help them."